Daily Fantasy Cafe is your one-stop shop for all the daily baseball you need, and our FanDuel MLB cheat sheets are your secret weapon against the competition. The daily fantasy baseball cheat sheets for FanDuel are put together by the brightest experts in the game. We're home to the most accurate MLB experts over the past four years as our FantasyPros accolades and badges indicate. While those accolades speak to our credentials, money talks. Our daily experts have grossed over $5 million in daily fantasy and we make our living covering daily fantasy sports. This isn't hobby, this is our life. Having gone through the ups and downs of daily fantasy, we know what information is useful and what can be dismissed. 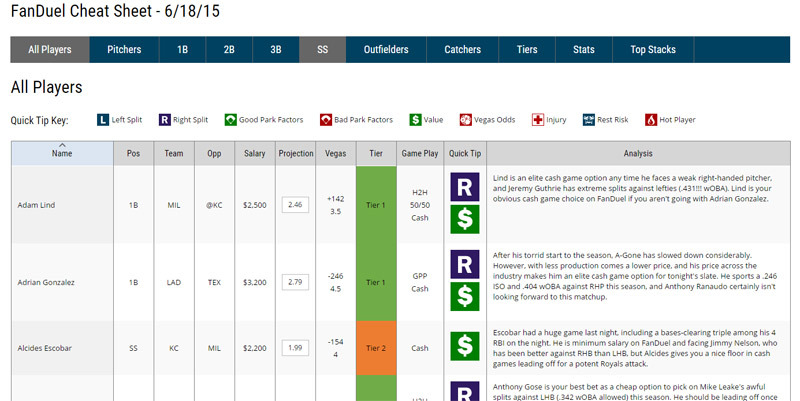 Our Fanduel baseball cheat sheets illustrate only the info you need to win cold, hard cash. No fluff stuff here. We understand not everyone has tons of time to dedicate to daily fantasy baseball research. The FanDuel MLB cheat sheets are a great time saver for serious daily gamers with a limited amount of time for research. The best part? You aren't cutting corners and skimping on important info. The FanDuel MLB cheat sheets have it all. It all starts with the stats. Check out the hitter stats below. At a glance, you can see basic info such as opponent, game location and player salary separated by each hitter position. If a player is hurt, which you'll know as a result of an easy to spot injury image, you can eliminate them from your pool of players for research. By eliminating the players from roster consideration, you can get rid of clutter. Now, we move on to the fun stuff. The hitter stats pages include a scoring projection. That's the lifeblood of all quick and useful daily baseball research. Wait, where are RBI, homers and batting average? This isn't your pop's baseball, those stats are antiquated and useless for daily baseball projection. Instead, the cheat sheets give you a quick glance at what matters such as park factor, team betting run total (Vegas knows a thing or two about setting lines, the proof is in their luxurious casinos and resorts) and advanced baseball metrics such as wOBA, ISO, OPS and wRC+ versus the handedness of the pitcher the listed hitters are facing on that given day. Also, unique to Daily Fantasy Cafe is our Cafe Value. This value accounts for all the important variables and offers you a sortable column for easily ranking players and making quick and informed roster decisions. Pitchers are of the utmost importance in daily baseball, and that's not lost on our moneymaking experts. We give them their due with an easy to read and understand stats page as well. Like the hitter stats page, you can see clearly the need to know basics such as opponent, game location and salary on the pitcher stats page. Also, you can eliminate any pitchers from consideration by simply excluding them. Because there are far fewer pitchers than hitters to choose between, you'll likely be more inclined to use our lock tool to lock in certain pitchers (the tool is also available for hitters). Wondering how dangerous it is to start a flyball pitcher you're enamored with? A glance at the homer park factors for lefties and righties will help you determine the answer to that question. Interested in knowing what Vegas expects from a given contest? Sort by opponent run total to see which games they're projecting to be the lowest scoring, and the best games to target a pitcher from, and the highest scoring, the best games to fade pitchers in. How a team fares against the handedness of a pitcher is great info for finding a potential bargain, and you can easily sort by opponent's wOBA, ISO and strikeout rate against the handedness of the pitcher they're facing. You can also benefit from the labor of our experts who are making money on a nightly basis by just looking at the projections and Daily Fantasy Cafe's own unique Cafe Value when trying to figure out which pitchers to use in that night's MLB contests. 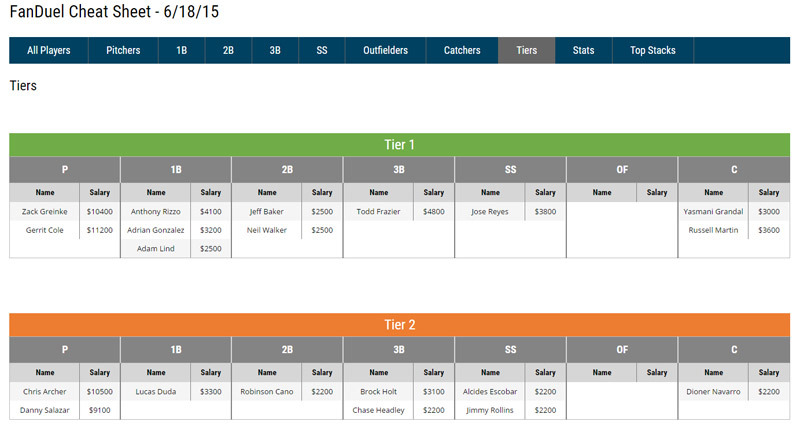 Tiers are a go-to for profitable MLB daily gamers like the Daily Fantasy Cafe experts. At a glance, you can see who the top options are at each position as well as who ranks as secondary options. If you've only got $3,400 left to spend on a second baseman, glance within each tier and spot the player who fits your budget and ranks the highest. Perhaps you have $8,000 left and two spots to fill such as first base and the outfield. By looking at the prices of players within each tier you can easily determine how to best spend your money and grab the best combination of players to fill your needs. There is no need for you to chop up the players by position so you can make informed roster decisions, we've done so in the tiers section. Don't make the mistake of just grabbing any player at a certain price point to fill out your FanDuel roster any longer. Find the player within the highest tier who fits your salary need. An already loaded product becomes a must have for serious daily gamers who want to win money in MLB daily baseball at FanDuel with the all players cheat sheet page. Behold the glory of the collective hard work of Daily Fantasy Cafe experts. The same experts who've grossed over $5 million in daily fantasy sports. Yup, that's us. We weren't always able to spend as much time as we do now researching daily games. We know that the vast majority of MLB daily gamers have full-time jobs, school, families, etc and this page is the time saver you need. Let us pass the fruits of our labor on to you in an easily digestible form! The must know info is presented in an easy to navigate and clean page with hard hitting analysis in bite size snippets for you. In addition to written analysis, you can use our Quick Tip Key to see important variables that will impact your potential daily baseball selections. Understanding whether a park is ideal for your potential pick is as easy as looking for the Good Park Factors icon. Worried about a player getting a day off? Look for our Rest Risk icon. When selecting GPP picks, it certainly can't hurt to know who is hot and a likely candidate for being rostered heavily. Our Hot Player icon will make these players stand out at a cursory glance. Also, speaking of GPPs, we offer you a Game Play column that passes on our suggestion for the best game types to select players in as well as info about whether they're a safe play or value pick. Remember our Tiers section highlighted above? You can see the tier each player resides in on this page, too. As you fill up your FanDuel rosters you can glance at what Vegas is projecting, sort by salary and pick the highest projected scoring player who fits within your budget constraints. Get Started with Free Access! Easy peasy! Stop wasting time looking over oodles and oodles of useless data. It's out there, but it's not here. Time is money, and not only will our FanDuel Cheat Sheets save you time, they'll make you money! Remember, we're home to the most accurate experts in the industry. The Fantasy Pros badges prove that. We're not just average Joes hypothesizing who makes for strong plays. We're profitable daily gamers -- to the tune of over $5 million -- who have taken our lumps and offer a treasure trove of valuable daily game info that will prevent you from making the same mistakes we initially made and no longer make. The top picks and info you see in the FanDuel cheat sheets is what we're using when we set our lineups and topple the competition night after night. Don't waste anymore time trying to figure things out on your own. More importantly, stop donating your hard-earned money to experienced daily gamers. The saying goes, you get what you pay for. Well, that's not entirely true. Get more than your money's worth with the FanDuel cheat sheets. Cafe is in our name, but skimp on a few over priced cups of joe at the local or chain gourmet coffee houses and get a much tastier treat here. Our treat will help you make the best kind of dough, the kind you can use to pamper yourself. Look no further. It doesn't get any better than the Daily Fantasy Cafe FanDuel cheat sheets. Stop thinking about making the purchase, do so and reap the rewards starting now!